For me, portraiture is one of the most inspiring genres of photography. I also find it pretty difficult to master, there’s so much to learn – but it’s what makes it so fun and appealing. In this video, photographer Jamie Windsor shares nine fantastic tips for giving a new dimension to your portraiture work. He focuses on studio shots, environmental portraits and street photography, and shares some precious advice to help you get the best out of your portraits. With group portraits, if all the subjects are looking at the camera, it “makes them lose their individuality.” It’s not necessarily a bad thing, it just depends on whether you want to achieve this or not. If they’re all looking in different directions, “you’re capturing a scene” and you’re “an overlooker.” If everyone’s looking in different direction, and one person is looking at the camera – the viewer will create the connection with that person. Think about the relationship between the foreground and the background. Think about what to include and what to exclude from the image. 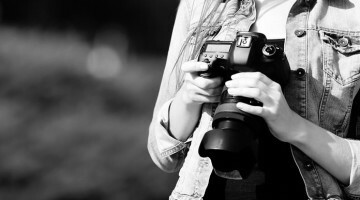 Consider the aperture – if it’s wider, you’ll get a blurred background and make the image completely about the subject. Smaller aperture makes the subject part of the environment. You create a stage for the subject and everything in the scene is important. You can also remove the background altogether and make it a single color. This removes the context from the photo, and works well with people of importance and celebrities, in a word: people who are recognizable. Sometimes, the scene alone can say a lot about the subject. You can sometimes say a lot about the person’s lifestyle values, routine, economic status, age etc. just by looking a photo of a scene from day daily life. I guess something similar to this was the idea of Justine Varga when she made the controversial portrait of her grandma and won the first prize. In this context, perhaps my shot from grandma’s retirement home room can also tell a lot about her life during the years she spent there. Think about what your lighting choice is saying about your portraits. The choice of light can say a lot about the portrait, and different lights create different moods. This isn’t only about the difference between natural and artificial lighting. It also refers to light at different parts of the day, weather conditions and seasons. With studio lights, you can create all kinds of setups with different kinds of lighting, and create various moods. Most people like to smile when they have their photo taken. However, Jamie calls it a “façade” and a “mask,” and I also think this often is the case. He suggests observing what your model does between the shots. Use that behavior and mood to direct them for the shots. You should make them lose the façade and step out of their comfort zone, make them think about something or read something, so they forget for a moment that they’re being photographed. Of course, if your vision requires the model to smile, there are some great techniques to have them do it naturally. Jamie also shares a couple of tips for taking photos of people in the street. For example, you can wait with your camera for a person to pass by. Or, you can set up the shot, wait for the person you chose to look at you and then press the shutter. Jamie shares a quote from David Foster Wallace: “You’ll worry less about what people think about you when you realize how seldom they do.” He sees this thought as very liberating, and I have to agree. When you realize most people mainly think about themselves, you can use it as a liberating force to do your work more confidently. You should also focus on yourself and improve your work. As you get better, your self-confidence will grow, but you can boost it with some other techniques. Jamie likes to listen to the music while he walks around and takes photos because it makes him feel more like an observer than a participant in the world around him. He also suggests just approaching people and asking them for a portrait. It can be awkward, but it could also help you break some barriers and boost your self-confidence. With wider lenses (24mm to 50mm), the subject is more in the context of the environment. With longer lenses (70mm to 135mm), you make the headshots that focus on your subject primarily. With long lenses such as 200mm, you can get a sort of a “paparazzi” and “voyeuristic” feel. So, before choosing the lens, choose what exactly you want to achieve and emphasize. This refers mainly to photographing people in the street. In a public place, you are allowed to photograph any adult person (unless you have some kind of a restraining order). If you don’t use the image for commercial purposes, you don’t need a model release. But, there are some behaviors to avoid. Don’t follow people around and take photos of them, it can get you arrested for harassment (and it’s creepy). Don’t show people in defamatory context, they also might sue you for that. Be careful about the celebrities as well, because they care a lot about their public image and they can sue you. For photographing children, you need permission from their parents or guardians. Don’t forget to follow the general rule – don’t be a jerk. If someone notices you and asks not to take their photo, don’t be a smartass and do it anyway because the law allows you to take photos in a public place. In some instances, even this can get you sued. So just put your camera down and find someone or something else to capture. If the police stop you, they can’t seize your gear and delete your photos if they believe if it will prevent a crime. If they seize your gear after all, get a receipt from them. When it comes to brands and logos, you can have them in the photos if they’re not the main subject and if you portray them honestly. Also, you can’t use these photos for commercial purposes. Of course, there are plenty more of rules and laws and a lot of exceptions and “grey areas.” Also, the laws are different in different countries. Still, make sure to study the laws of your country before you hit the streets and start photographing people. Don’t cut your session too early. There will be changes in mood during the shoot, put you should push through it and keep shooting. In the end, you’ll get the shots you want. I’ve been into photography for almost a decade, but I still consider myself a beginner when it comes to portraits. There’s still a lot to learn and so many fears to overcome, which is why I found this video inspiring and useful. And I hope you did, too. « Gimbals – Are they terrible and overused or a valuable storytelling tool? Another of my videos… Hmmm.